The Beardmore W.B 2 is a conventional two-seater fighter equipped with а 230 h.p. Hispano-Suiza engine. The main planes are heavily staggered. The pilot is situated under the trailing edge of the top plane and the observer over the trailing edge of the bottom plane, giving both an excellent view all round. The type W.B 2a. is a modified version of this machine fitted with a Beardmore " Adriatic " engine of 230 h.p and with increased tank capacity. Vertical area of body 75 sq. it. Engine type and h.p. Beardmore Adriatic, 230 h.p. Airscrew and revs. 10 ft. 1,350 r.p.m. Weight of machine empty 1,650 lbs. Load per sq.ft. 7.6 lbs. Weight per h.p. 11.7 lbs. Tank capacity in hours 4.5 hours. Tank capacity in gallons. 75 gallons. Speed low down 125 m.p.h. Speed at 10.000 feet 117 m.p.h. To 5,000 feet in minutes 5 minutes. To 10,000 feet in minutes 12 minutes. Disposable load apart from fuel 460 lbs. Total weight of machine loaded 2,700 lbs. W.B. II. As was becoming to a company having Beardmore's standing in the fields of naval architecture and gunnery, the W.B. II two-seat fighter (also suitable for reconnaissance and patrol) exhibited originality in armament. The first machine (1917) had a fixed Vickers gun and a Lewis gun on a simple ring-mounting. The second was higher powered, and even more interesting than its twin-Vickers-gun installation - its Lewis gun was on a Beardmore-Richards mounting, designed by G. Tilghman-Richards and nicknamed 'The Witch's Broomstick'. The central member of this mounting was a pillar mounted on a 'universal footstep bearing' at its lower end and supported by, and guided upon, a coaxial annular guide ring round which it could be traversed. 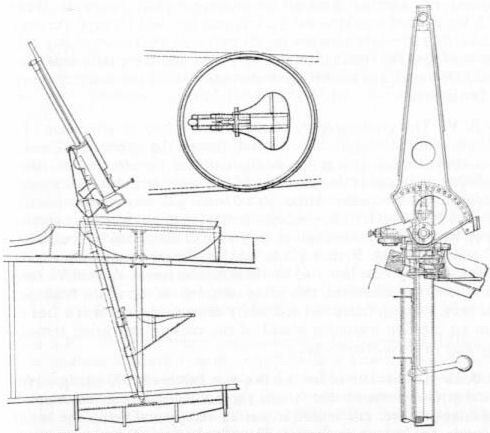 This arm carried at its upper end a gun-arm, one end of which was mounted on a pivot pin carried by the pillar, the other end being fitted with a pivoted block carrying the stem of a fork to which the gun was secured. The pillar could be locked in any position round the guide ring and the gun-arm could be locked in any position relative to the pillar. The locking was effected by spring-actuated bolts carried by the pillar and operated by levers, likewise on the pillar. The pillar was further fitted with a seat, capable of being locked at any desired height. With the pillar displaced laterally to its full extent the line of fire could extend to 15 degrees past the centre line of the aircraft. During the course of W.B. II development the guide ring was built up from the fuselage to enhance the gun's effectiveness and the gunner's comfort. A two-seat fighter built as a private venture and based on the design of the B.E.2c by G Tilghman-Richards of William Beardmore & Co, the W.B.II was powered by a 200 hp Hispano-Suiza 8Bd eight-cylinder water-cooled engine. It carried an armament of two fixed synchronised 0.303-in (7,7-mm) Vickers guns and a single 0.303-in (7,7-mm) Lewis gun on a swivelling Beardmore-Richards mounting. The W.B.II was first flown on 30 August 1917, and performance proved good, but the Hispano-Suiza engine was in short supply and was required for the S.E.5a single-seater. No production of the W.B.II was therefore undertaken, although two civil examples were built in 1920 as the W.B.IIB. Max speed, 120 mph (193 km/h) at sea level, 111 mph (179 km/h) at 10,000 ft (3 050 m). Time to 5,000 ft (1524 m), 10 min. Empty weight, 1,765 lb (800 kg). Loaded weight, 2,650 lb (1202 kg). Span, 34 ft 10 in (10,62 m). Length, 26 ft 10 in (8,18 m). Height, 10 ft 0 in (3,05 m). Wing area, 354 sq ft (32,88 m 2). Built as a private venture by William Beardmore & Co Ltd in 1917, the W.B.II two-seat fighter is shown at Martlesham Heath in December that year. Front View of an early Beardmore Single-seater Biplane. 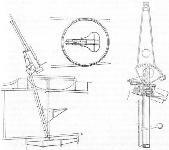 Secrets of 'The Witch's Broomstick' - the Tilghman-Richards gun mounting for the Beardmore W.B.II - seen in original makers' drawings. The detail view shows the locking arrangements for the gun arm.